After the success of the first two BEVA Trust volunteers, Sara Fleck and Christine Fuchs, visit to the Gambia Horse and Donkey Trust (GHDT) in December last year, another opportunity was given to me, to visit the charity in the beginning of February. I had volunteered with the charity at the end of my time at university and was very excited to be given the opportunity to visit the charity again. The GHDT, which is run by the director Heather Armstrong and managed by the two long term volunteers, Katana Ashby from the UK and Karelhia Garcia-Lopez from Venezuela, has two bases. One in Sambel Kunda which is the original site of the charity and Makasutu which is located only 30 minutes from Banjul airport. Because I had seen the start of the building of the Makasutu centre on my previous trip, it was incredible to see how large a clinic it has become. The centre in Makasutu is run by the two long term volunteers and they play a vital role in giving the short term volunteers the ability to hit the ground running when arriving at the centre and to ensure that they work well together with the para-veterinarians and the apprentices to be able to make the most of their time there. This showed as the moment I arrived, we were called out to a foal with tetanus. I was able to go with the team to visit the foal straight away. The foal was admitted the next day and has been slowly improving. The para veterinarians and apprentices are responsible for the care for the patients that are admitted to the clinic. As a volunteer, the goal is to help the team at the centre in any way possible. Mostly this involves helping the GHDT team treat the current patients in the clinic and to teach and discuss every aspect of veterinary medicine. This also works both ways as many problems that the team deals with are diseases that are unknown to veterinarians working in Europe like trypanosomiasis, epizootic lymphangitis and fistulous withers. 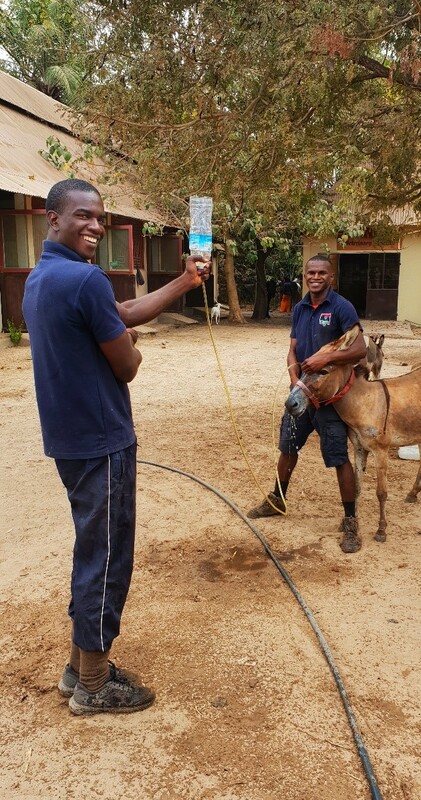 Because a working, healthy donkey or horse can be a valuable asset to farmers and can increase their income by 500% in The Gambia, education is a critical part of the GHDT. They teach owners about correct harnessing, bits and how to keep their animals healthy. 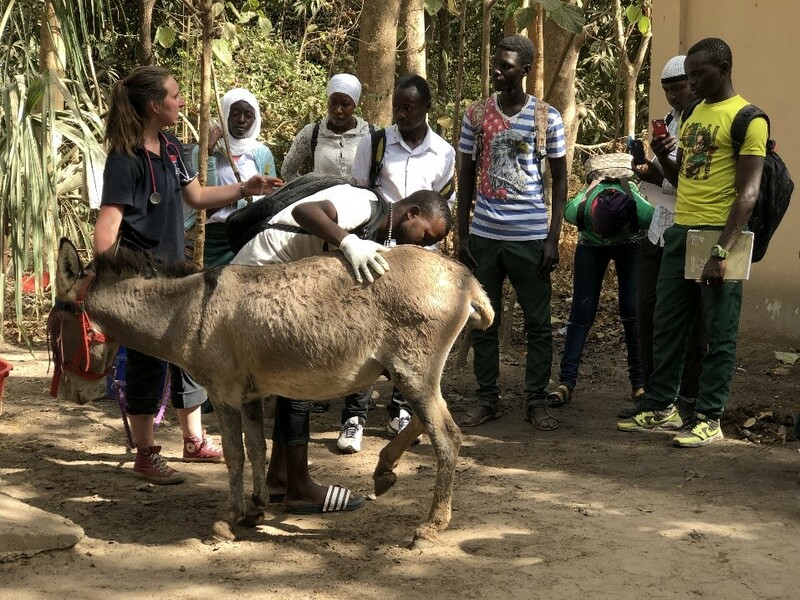 Part of this is done on the road, when visiting animals or when mobile clinics or ‘treks’ are run, but the GHDT educates students as well, which is done on a regular bases on Saturdays. This includes talking about wound management, performing a clinical exam and many other subjects. There are many challenges to the life at GHDT. One of the challenges is getting to the animals that are in need. Because veterinary care is limited in The Gambia, sometimes the animals in need can be very far away. An example was a donkey, that was noticed by a tourist, that was most likely hit by a car, had been unable to stand and had a possible broken leg. The time it took to travel to the poor animal was 4 ½ hours. Sadly the animal had already died when we arrived. Even with these difficulties it is inspiring to see how determined the team at the GHDT are to try a support all the animals that are in need of veterinary care and to improved their welfare. I had a wonderful time working with all the people involved. I hope the team at GHDT will continue the important work of reducing poverty by improving the health, welfare and productivity of working animals and that more people will take the opportunity to support this great charity..